Records are the information your app uses, much like individual rows in a spreadsheet. These records are stored in your database and are grouped by objects. Each column specifies a field, which is a specific type of information in that record, and each row is an individual record. You’ll then want to match each column from your spreadsheet with one of the fields of your object. If the field doesn’t exist yet you can use the import to create new ones. Click here to learn more about importing records. 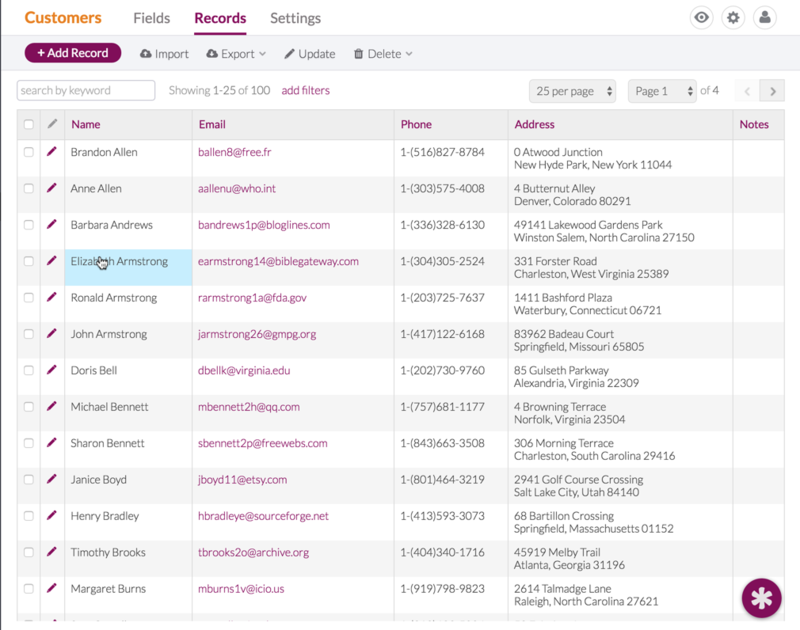 You’ll most likely want to create pages in your live application (Live App) for users to add records to your database. For example, you could add a survey that you want to embed in your website for your clients to fill out. Click here to learn more about building your Live App. The form view is used to add records in a live application. Each form view is completely customizable: you can choose which fields to include in the form, as well as update the labels, instructions and order of each individual field. 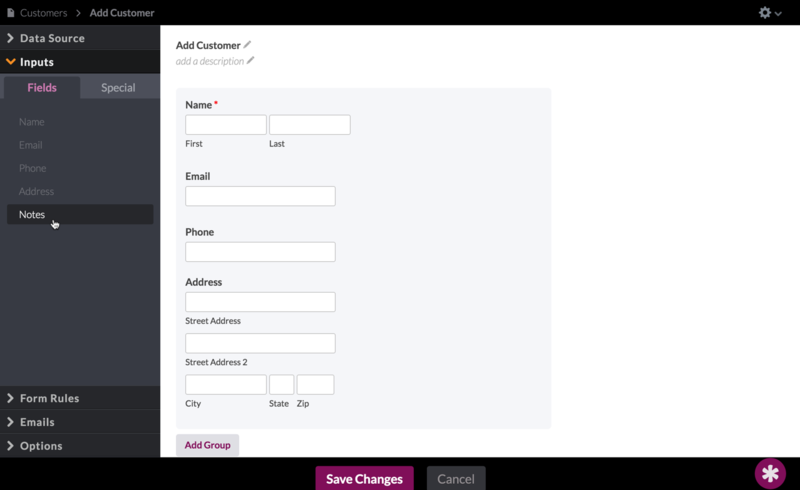 These forms also come loaded with great workflow features like custom emails, logic, multi-step, and more. Click here to learn more about form views. Once records are added to your database, there are a variety of ways to update those records. Much like adding records (see above), you’ll likely want to design certain pages in your live application to update records. You’ll still use the form, but typically you’ll first select the record you want to update from another view, like a list or calendar. Table views also have an "inline edit" option available where you can edit each field in the view individually. 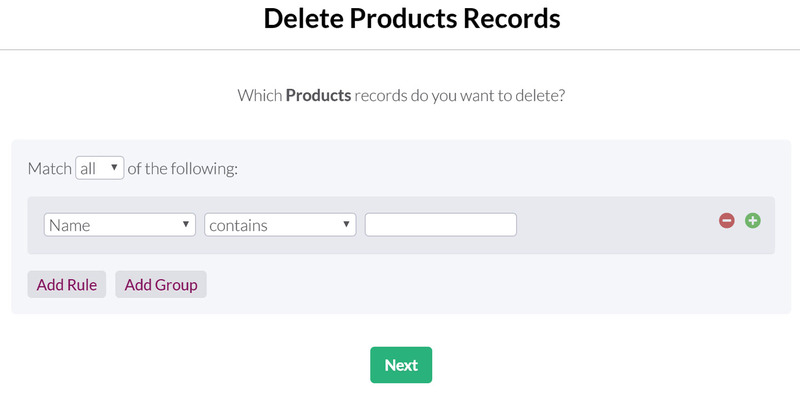 You can delete any record directly from your database by first selecting the checkbox of the record you wish to delete. The records toolbar will update and present a "delete" button to delete any checked records. You can delete multiple records at once in batches by creating a query. Use the "Delete" menu in the records toolbar. Most views in your live application can include special links for your app users to delete specific records. Your data, so you can export it any time. Exporting directly from the database. At this time we don’t have an option for exporting an entire application at once, but this is something we hope to be adding soon. You can still export each object individually by navigating to the Records tab and clicking the "Export" menu in the toolbar. Most views like tables and lists have options for adding an export link so your users can export records directly from the live application. Each export will only include the fields that were added to that view and will also follow any filters and queries added to that view, so these exports allow you to control which data would be included. Storing your data is only step 1 - you also need to query your data so you can find exactly what you are looking for. You can search your records by both keyword and individual fields to find the records you need. The keyword search is located above the table of records. You can also click the "add filters" link to add more precise filters by a specific field. Multiple filters can be combined with "and" or “or” to indicate whether all the filters (“and”) should be true or any of the filters (“or”) should be true to return a matched record. Each view has similar options for your users to search by keyword or filter. You can also control the data source of a view to add additional filters that the user can’t change. That way you can define exactly which records your users are meant to see. Additionally, views like searches and reports provide additional functionality that can be added to your live applications. A search view can let you filter by fields from both the main object and any connected objects. For example, you could search orders by any order field, but also by any of fields from customers that are connected to each order. Up next, learn more about building your live app.